Following the Governor General’s Innovation Awards ceremony on May 23, the 2018 award laureates had a candid discussion about the diverse and extraordinary landscape of innovation in Canada. In this “big thinking” panel discussion organized in partnership with the Rideau Hall Foundation, the laureates shared stories of challenge and triumph, and discussed what policy issues Canada needs to confront to become more of an “innovation nation.” The event was part of Canadian Innovation Week which runs from May 22 to 31. The moderated panel ran from 4 to 5 p.m. and a cocktail reception followed. 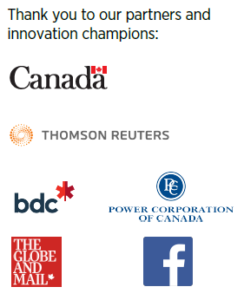 About the awards: The Governor General’s Innovation Awards recognize and celebrate outstanding Canadian individuals, teams and organizations — trailblazers and creators who contribute to our country’s success, who help shape our future and who inspire the next generation. From Ebola to empathy: Read our profiles of the 2018 laureates.